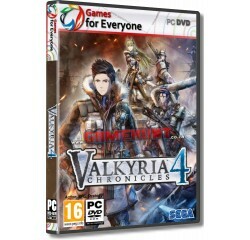 Valkyria Chronicles 4 - R220,00 : Game Hunt, Where we lead, others follow. A Coming-of-Age Story in a Time of War - Take command of the determined, young Commander Claude Wallace, engineer/heavy weapons extraordinaire Riley Miller, hot-headed Darcsen Raz, ice-cold ace sniper Kai Schulen, and more. Together, they will experience the painful realities of war - but will the bonds of Squad E's friendships survive the frozen battlefield? The Next Generation ""BLiTZ"" Battle System - Part overhead turn-based strategy, part RPG, and part real-time 3rd person shooter, the "BLiTZ" battle system returns to the field. New features include an explosive new class called the Grenadier, numerous offensive/defensive battleship support options, chances for a unit to have a "Last Stand" action before death, and more. Plus, fight the imperial threat with more units on larger-scale maps than ever before. CANVAS Aesthetics - The series' signature hand-drawn visual style is back and overhauled for the newest generation. Inspired by watercolour compositions, the CANVAS Graphics Engine blends visual elements of reality and imagination to create an expressive world filled with colourful emotions. Watch the journey of Squad E unfold like an interactive painting! Optimised for PC - 4K resolutions, customisable keyboard and mouse controls, even ultra- widescreen support. Also includes achievements and Steam trading cards. Processor - Intel Core i3 6100 or equivalent AMD® or equivalent AMD® processor.